When you’ve had enough of dust mites allergy, the bedroom is the main suspect. There are literally millions of dust mites in making a home in your bedding. But once you got rid of them, you’ll want to prevent the bugs from breeding in the mattress again and using a dust mite cover is a great option. Dust mites are tiny little microscopic creatures that become inhabitants wherever they found dust. Often called as house dust mites, are closely related to spiders and are mainly fond of carpets, curtains, bedding, furniture, and mattresses. In addition to striving on dust, these creatures live on small flakes of skin and love humid environments and warm temperature. These can cause allergies along with other skin conditions. Dust mite allergy can be severe or mild. In mild condition, you may have runny nose occasionally, sneeze, and have watery eyes, while in sever matter, intensive cough, congestion, persisting sneezing, asthma attack, chest tightness, and facial pressure can occur. It is highly recommended to remain protected from house dust mites through proper cleaning and following all precautionary measures. Warm and humid places create favorable places for dust mites to feel comfortable in, and our mattresses make the perfect environment in this regard. If you are suffering from any allergy else desire to remain safe from any types of bugs, then dust mite covers are exceptionally necessary to put on the mattresses. It is zippered and perfectly covering the mattress from all sides. It is designed with special allergy blocking fabric. It perfectly encases the mattress and pillows as well, blocking no entry from any side. 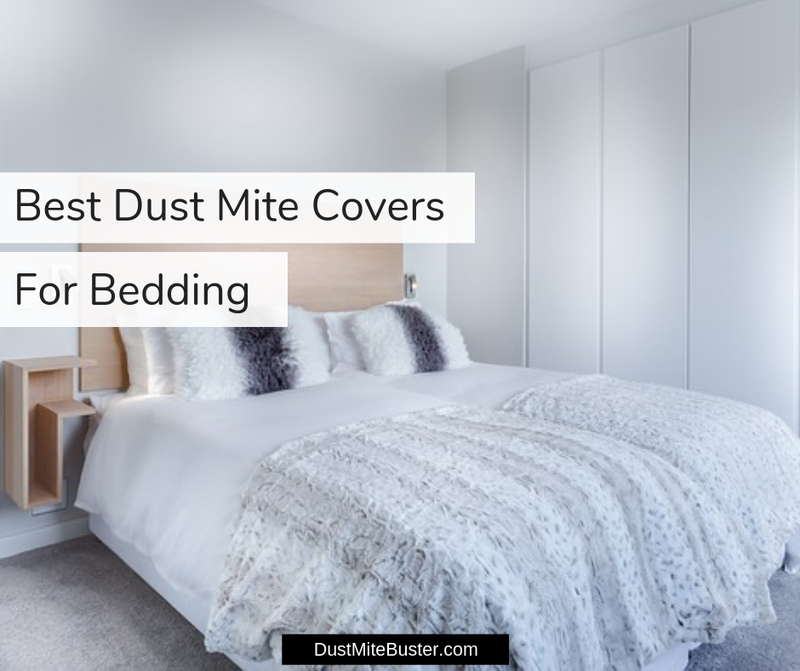 The construction, material, and quality of dust mite covers or mattress protectors are different from a simple pillow or mattress encasement, so be sure to notice these characteristics before making any purchase. The dust mite covers are essentially needed to protect you from allergen that is present on the body of dust mites and is expelled as the waste. This protein can be a causative agent for several skin conditions and respiratory diseases. Taking mattresses as the huge source of harboring the sources of allergic skin and respiratory conditions is definitely the single recommendation that is the same from every dermatologist you consult. It is a scientifically proven fact that mattresses provide perfect environmental conditions to dust mites as per a research conducted in houses of Ohio, researchers found out that density of dust mites at homes is about 18,875 mites per gram of dust. And as per observation and trend of their growth, a single mattress can be home to thousands to many million dust mites, depending upon the worsening of the condition. Thus, it is extremely necessary to protect your mattresses and shield them from these allergens, and germs. Protection of your mattress from these tiny devils is extremely important, and covering them with waterproof, hypoallergenic covers is a highly recommended solution to the problem. Waterproof mattress protectors raise the protection level to greater heights, as the goal is not only to close the entry of the mites inside the mattress but also nullify the suitable ambiance for their growth. Scientific research has proved that decreasing the humidity level in the home can massively lessen the presence of house mites and various other allergens. Plus, a mattress cover having the characteristic of temperature balancing is an ideal pick as maintenance of specific temperature that is not suitable for the production of mite eggs can also decrease the chances of dust mite prevalence in mattresses. Most importantly, keeping your cover, sheets, and pillows clean is extremely important as well. Purchasing an easy to wash cover that retains its quality after several washes is deal for a longer period of time. A clean mattress cover is significantly vital to enjoying the hygienic environment. Do You Need Dust Mite Covers On Every Type Of Mattress? Well, it is highly recommended to spread mattress covers after purchasing new pillows and mattresses in order to be perfectly protected from any sort of germs. All except natural latex mattresses require dust mite covers. Natural latex or memory foam mattresses are hypoallergenic as they are highly compact providing no space for the entrapment of dust, and thus no mite production. While mattresses designed with unnatural foam or synthetic material have an interwoven honeycomb structure that acts as an excellent habitat for the dust mites and their waste. The study has shown that the difference of material can positively affect the density and rate of growth of dust mites. How To Wash Dust Mite Covers? Dust mite covers, no matter from which company you have purchased, do not necessarily need to be washed before putting them on for the first time. Some people prefer to vacuum the mattress before spreading the sheets, but it’s totally up to you. Instruction to wash the mattress cover is usually displayed on the packaging. Simply, turn on the warm or cold water tap for the first wash and fill in the washer to half level, add detergent in the water and swirl around. Then add your zippered cover and turn on the machine. Then move it to low tumble dry. Your cover is ready to be used. Now, talking about subsequent washing. Its a frequently asked question that how often you should wash your mattress cover. Well, the simple answer is whenever you think it is dirty. Because if you have kids or pets around then the probability of nominal accidents is high, so you can wash it every 4 to 6 weeks. Generally, you must flip your mattress, and wash whole bedding twice a year. On subsequent washing leave the zipper open. If the cover is made of micro-weave fabric then it is recommended to turn inside out, and if it is linen fabric then leave as is. If handled with proper care, your mattress cover can remain efficiently working for many years. We spend at least 8 hours a day on the very place that is loved by dust mites. Encasement of the mattress with a high-quality dust mite cover is the most effective way to be safe from the spread of dust mites inside the mattress. But only having a logo of anti-dust mites on the mattress cover is not enough, following are some crucial factors that mattress cover must have. Generally, the size of a house dust mite is 0.2-0.3mm (0.008-0.012 in) in length. So, the mattress cover specifically designed to encase mattress against these creatures must be woven tightly enough to forbid their entrance, keeping in mind that it remains breathable for a comfortable sleep. A recommended pore size of the cover is between 0.002-0.006 mm. Thread count or number threads per inch indicates the fineness of the fabric. A good mattress cover’s thread count must be 246. The tightly fitted cover on the mattress that is enclosed with a zipper ensures full protection from dust mites and allergens. The fabric of the cover must be easy to wash in the machine and be able to withstand hot water, in order to properly clean the sheets. You’ll find numerous brands online and in the market dealing with mattress covers specially designed to protect against dust mites. Here I have enlisted a few of the highly proficient options that will help you decide as per specific characteristics of each product, and customer reviews. Finding perfect bedding means ticking several boxes, including comfort, high quality, and flawless fit. And covering the hygienic level as well, dust mite proof covers are surely much needed. In this regard, Utopia Bedding produces one of the best mattress covers that have all these highlighted features. These mattress covers are available in different sizes, covering all kinds of bedding range available in the market. The cover is perfectly designed to cover the mattress inside all the way to 360 degrees that keeps any sorts of mites and bugs rendered from entering and making a home inside the mattress. Moreover, there is a PVC waterproof packaging on all sides of the cover that help in resisting any leakage. Another comforting feature of this cover is that you can easily wash it in the machine and tumble dry to keep it properly cleaned. Made with a hypoallergenic barrier, making bug, mites and dust proof. Zippered bag for perfect encasement, and safety from bug entrance. 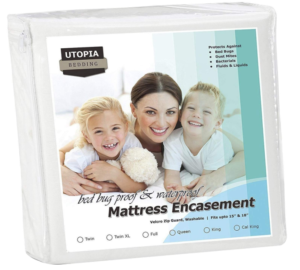 Impermeable TPU backing on all sides of mattress that keep it away from stains. A few people complained about poor stitching near the seam. 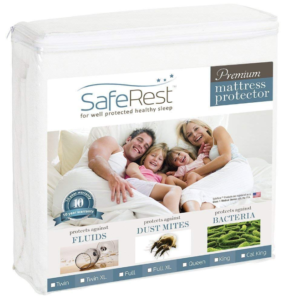 SafeRest is a highly recommended brand for buying all kinds of mattress protector products. Their indulgence in each and every aspect, extensive and thorough research regarding designing, manufacturing, quality, and material, and use of cutting edge high tech at all the different steps of creating the comforting products is incredible and makes this brand one of the best. 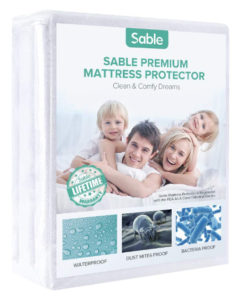 SafeRest certainly has ticked all the boxes in manufacturing high-quality mattress protectors. They use highly comfortable material to the skin, cotton, to make the covers. One of the incredibly appealing features of this cover is that it is great for people to have small kids, suffering through any sort of allergies, eczema, or asthma. All in all, it gives you protection from bacteria, allergens, perspiration, all types of fluid spillage, and dust mites. Moreover, the company gives a whopping 10-year product replacement warranty. Definitely, a great option to protect yourself and the mattress from being in an unhygienic and dirty environment. Safeguard from allergens, and fluids. Cotton is breathable, lightweight, noiseless, and feels comfortable to lay down on. Cover sheets are not zippered to keep the cover in place. 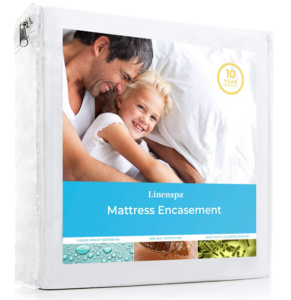 LinenSpa came in the market in 2003, and with their impeccable quality, excellent services, remarkable products and a wide range of bedding products they became competitors with the established brands. Talking about the mattress covers by LinenSpa, these speak the high quality, and excellent manufacturing process in a single look. All six sides of the covers will be perfectly safeguarded with this zippered, waterproof cover and your mattress will remain perfectly packed inside. Lightweight material feels immensely comfortable, smooth, and breathable, and sure super protective against all kinds of bugs, and dust mites. These mattress covers are available in 11 different sizes, covering the whole range of beddings available in the market. So, whichever bed size you own, you’ll have something suitable for you at this place, without compromising on the quality of the product. Provides 360-degree protection by wholly surrounding the mattress with zipper. Noiseless, ensuring no disturbance in deep sleep. 100% waterproof and complete protection from bugs. Quality and efficiency of the mattress covers were not up to the mark for some customers. Researchers at Hopitology understand the need for sleep and numerous health advantages that come along with good night sleep. Through their thoughtful research in all steps of manufacturing, quality designing, and use of high tech fabric, their products enhance the probability of you taking a better, peaceful, and serene deep sleep. This eventually helps in the betterment of your mood, physical and mental health, reduce extra body fat, and decrease disease rate. The zippered mattress protector from Hospitology truly reflect all the beneficial aspects that are attached to this brand. This cover perfectly blocks entering of any allergens making it a great pick for people having any respiratory conditions. It is ideal to be put on latex or foam mattress, and it fits perfectly on all 6 sides of the mattress keeping your mattress secure. Moreover, it is waterproof, so no need to worry in case of any spillage. Independently tested in the lab to be bug proof. Soft, breathable, and comfortable 100% polyester fabric. Ease respiratory conditions such as asthma through blocking allergens. Some customers complained about cover entrapping heat and making it hot to sleep on. 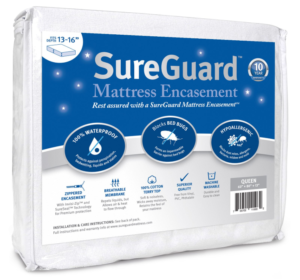 SafeGuard mattress protectors and mattresses are a great pick to solve all your bedding issues, from the same place. These products are loaded with all the much-needed qualities from the mattress and mattress protector. Most importantly, it provides freedom from any sort of allergy issues by blocking dust mites, mold growth, pollen, and pet dander. The hygienic level of this protector is up to the mark, and highly recommended. In addition to that, the fabric is of exceptional quality. It feels smooth and comfortable to lay on, cool and breathable, and also easy to machine wash and tumble dry. The superior quality of zipper and amazing craftsmanship produce a high-quality final product that is GREENGUARD Gold certified. Additionally, you can claim your money back within 30 days of making a purchase, in case you didn’t approve the quality. Plus, the company offers 10 years long full replacement warranty. Free from any toxic chemicals, PVC, vinyl, fire retardants, and phthalates. Adorned with SureSeal technology promising perfect encasement of the mattress. Comes with a 10-year guarantee from the company. Some customers reported a low quality of these covers. CalmNite truly lives up to its name by delivering a wide range of home decor products ensuring your mental peace, and aesthetically gorgeous appeal to your place. You can checkout curtains, cushions, silk tapestry, cashmere sheets, tablecloth, and of course premium quality mattress protectors to keep you protected from allergy triggers, germs, and dust mites. The mattress protectors are available in different sizes, making it easy to choose the perfect fit for your mattress. Manufactured using soft knit polyester fabric that is specifically designed after thorough research to be waterproof, stain proof, and comfortably soft for the skin. CalmNite protectors have a thin hypoallergenic barrier on top, that keep your guarded from microscopic allergens, and dust mites during your sleep. This barrier forbids touching of your skin cells with the foamy mattress thus you’ll remain away from an allergic condition. It is free from fire retardants and any toxic material thus becoming eco-friendly and safe to use. Lab tested to be easily washed without ruining the quality of the fabric till 200+ washes. Protection from stains and spillage with the help of 0.02mm membrane layer on top. A few customers showed concerns over waterproofing quality of the sheets. Tru Lite is a one-stop shop for all your bedding needs. This company takes pride in producing high-quality products that ensure comfort, bug protection, and relief while being extremely affordable and easily reachable by everyone. 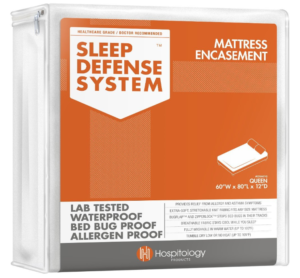 These products truly live up to the claims of protecting the sleepers from bed bugs, allergens, and dust mites, and providing the stress-free sleep. 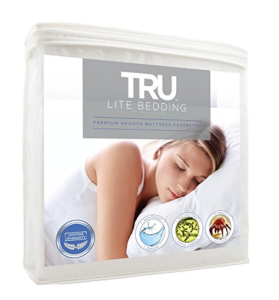 Mattress protectors from Tru Lite bedding are adorned with numerous qualities to ensure your happy sleep for a healthy start next day. Made with microfibers, these covers fit superbly on different sizes of mattresses and are smooth and breathable. After laying down, you can relax your body easily without hearing creepy, irritating sounds, and plastic type feel. With these protectors on the mattress, forget worrying about spillage of water, sweating stains, and urine spillage accidents, as these are 100% waterproof and easy to wash as well. Gives perfect protection to your mattress against bugs and dust mites. Feels super smooth and produce no irritating noises. Hypoallergenic, waterproof and guarantee safety. A few customers complained about its plastic feel. Sable’s objective is to pamper their customers with utmost care, providing superior quality home essentials that guarantee comfort, support relaxation, and ease in an affordable price range. Sable has gained a huge customer base because of its premium quality bedding essentials and extraordinary customer support. You can check out a wide range of products there including, comfy mattress protectors, silky soft pillows, richly textured warm blankets, amazingly serene body pillows, and comforters. The high quality of home essentials by Sable makes it lucrative for new customers. Produced using an FDA approved formula of 80% cotton and 20% polyester, the fabric of mattress protector is hygienically certified and feels smooth and soft to the body. The differentiating feature of this mattress protector is its fitting on the mattress through elastic bands rather than with zipper. Surely unexpected, but definitely efficient. Perfect fit of the protector forbids allergens, dust mites, and germs from making a home inside the mattress thus keeping you safe from the unhygienic environment. Certified as A Class 1 Medical device from FDA. A soundless fabric consisting of cotton terrycloth material that is comfortable and breathable. Protects water spillage stains through a thin membrane barrier. Some customers complained about it not being waterproof. 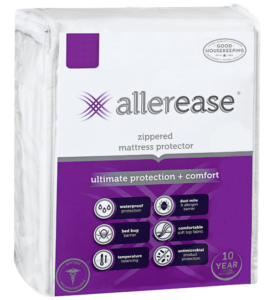 AllerEase particularly deals with mattress protectors ensuring that the final products are made with intense research and with the use of cutting edge technology in order to make the most comforting, premium quality, and soft sheets that will protect your loved ones from dirt and allergens. 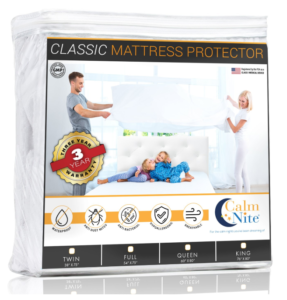 They have a comprehensive guide that makes it easy for you to purchase the best-suited protectors for your mattress. Such as, depression in the vacuum of the mattress can reduce the entry of allergens thus padding it before purchasing the protector will be greatly beneficial in the long run. These protectors are especially best suited for the family having beautiful kids and lovely pets, as in such household spillage of liquid is a norm. These protectors are waterproof and stain free so no worry about that. A distinguishing feature of these protectors is the indulgence of temperature balancing technology that adjusts the temperature of the bedding as per your body temperature, so you’ll always feel good, neither hot nor cold. Presence of Velcro flap to tuck in the zipper, creating a double seal that ensures entry of no bug or dust mites whatsoever. Comfortable zipper and fully locked mattress keep it clean, fresh and odor free for a longer period of time. Equipped with temperature balancing technology that works according to your body temperature. The fabric of the protector is problematic for some people. 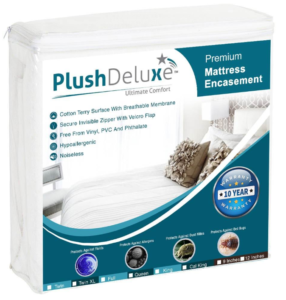 PlushDeluxe provides supreme quality bedding products. The mattress protectors ticks all the boxes regarding quality, and efficiency of the product. Presence of invisible zipper at all 6 sides that is again secured with a Velcro flap make it perfectly protected against bed bugs and dust mites. This is super easy to machine wash and low tumble dry. The fabric is soft, comfortable and noiseless and perfectly fit on the mattress. PlushDeluxe gives an amazing deal to its customers. You can purchase your preferred protectors with full 10-year money back, and replacement warranty, so you can replace it whenever you are not satisfied with your pick. Comfortable fabric, free from PVC, Vinyl, and Phthalate. An invisible zipper that is perfectly secured with Velcro Flab ensuring a proper fit on the mattress. Hypoallergenic and bed bug proof. Have comparatively higher price range. You’ll never want dust mites breeding rampantly in your mattress again. I hope you’ve got the right dust mite cover to keep the unseen pests away from your beddings for good. Does Lysol Kill Dust Mites? 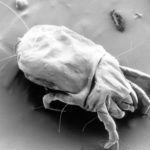 Where Do Dust Mites Come From? I'm a writer, online business owner and a single dad blessed with an energetic son. I've been in a constant battle with dust mites since my son first displayed the symptoms when he was 5.